Daughters of the Dragon left me haunted. The atrocities that occurred during World War II in countries outside of Europe, have long remained unspoken. Thankfully, because of books like Daughters of the Dragon, the truth will be revealed. And those who suffered never seeing justice, may find rest in knowing they no longer bear the shame of silence. 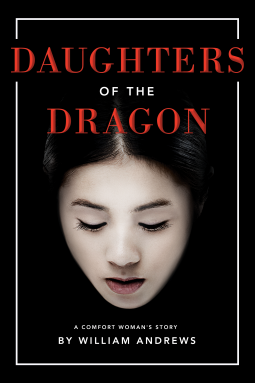 When an American Korean girl goes to Seoul in search of her birth mother, she finds history in her heritage that rocks her to the core. Meeting her maternal grandmother, Anna learns her Korean name and the meaning behind it. Moreover, she discovers the tragedy and strength that runs in her veins. I cannot say enough about Daughters of the Dragon. It’s a powerful story of discovery. Of loss. It demonstrates the power of a woman’s ability to survive and the beauty of a mother’s love that flows through countless generations. William Andrews does a magnificent job of weaving history into a believable fiction story. He incorporates every essential piece to allow for the ambiance of the time as well as provide connection between the reader and the characters. I absolutely recommend Daughters of the Dragon. I received this book from Netgalley and Lake Union Publishing in exchange for my honest opinion which I’ve provided here.